The purpose of this assignment was to understand the data included in the output Excel workbook by analyzing the optimized values returned from the MATLAB program as well as to propose further experimentation that could lead to interesting results. The output workbook that was created last week was used to identify the least squares error (LSE) for our model. On the "optimization_diagnostics" worksheet, the LSE:minLSE ratios for the ten models run by everyone in the class were compared and analyzed. The output Excel workbook was then uploaded to GRNsight and the the actual data for a strain was compared with the simulated data from the same strain to see where there was a good fit versus a bad fit. A table was created to organize the genes along with their respective number of incoming arrows, Benjamini & Hochberg corrected p-value, and the relative change of gene expression. Bar charts were created for the b and P parameters to give additional insight on the goodness of fit for the individual genes. To proceed with the in silico experiment, my homework partner Angela and I discussed possible ideas that we could "tweak" to the original protocol. In our initial runs, we estimated all three parameters w, P, and b. What is the LSE to minLSE ratio? Which genes are modeled well? 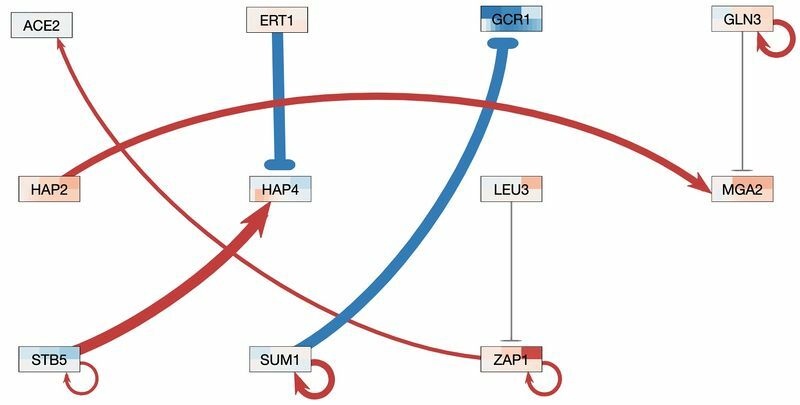 Which genes are not modeled well? Table 1. Genes including rows with respective number of incoming arrows, Benjamini & Hochberg corrected p-value, and the relative change of gene expression. The color of the top half of a node will match or follow a close enough trend as the bottom half of each gene in a good fit. Likewise, if the colors do not match then it is a poor fit. The intensity or boldness of the color plays a factor as well. To access the optimization diagnostic as well as the individual expression plots produced by MATLAB click here. To view the output Excel workbook produced from MATLAB, click here. The Final Powerpoint Presentation is linked here. Figure 1. The gene map produced by GRNsight displayed 11 nodes and 11 edges. The top half of the node was set to wt_log2_expression while the bottom half was set to wt_log2_optimized_expression using the average replicate values for both. The log fold change maximum value was left at 3. Figure 2. 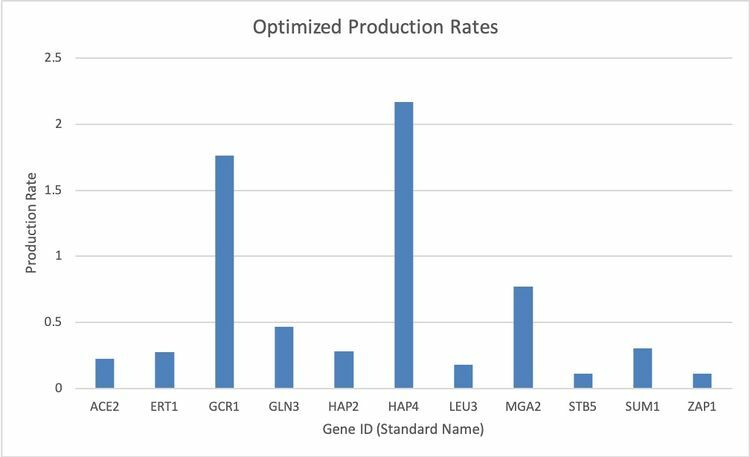 This bar graph represents the optimized production rates (P) of the genes as per the output Excel workbook. Figure 3. 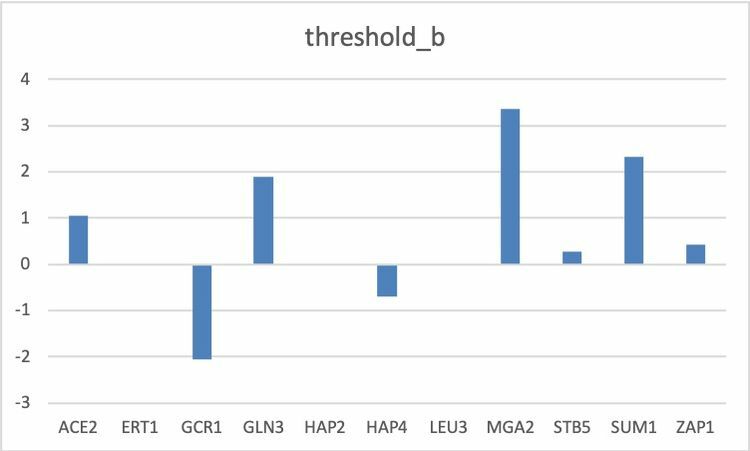 This bar graph represents the optimized threshold_b values (b) of the genes as per the output Excel workbook. In this experiment, we analyzed the goodness of fit of the model created through the MATLAB program and used that to compare gene expression changes. After analyzing the data, it is believed that there is no coorelation or significant data based on the optimized production rates and the optimized threshold_b. For our in silico experiment my partner and I have chosen to keep the genes that were originally deleted from the GRNsight network because they were disconnected nodes. Angela Abarquez, and I communicated in class and via text for clarifications regarding the tweak we would make in our methods for the in silico experiment. Except for what is noted above, this individual journal entry was completed by me and not copied from another source. The Week 7 Assignment was used to create this assignment, specifically in formulating the methods and answering protocol questions.